Madagascar is a large unexplored Island off the coast of Africa in the Indian Ocean with an incredible diversity of wildlife and flora endemic to Madagascar. Madagascar’s landscapes, people, beaches and undiscovered areas will delight those with a taste for discovery. A holiday to Madagascar can expose you to mountains, rain forest, dazzling beaches & coral reef surrounded by clear warm waters. Madagascar island offers diverse and spectacular scenery: mountains, deserts, rainforests, dazzling beaches fringing the Indian Ocean and island archipelagos linked by coral reefs and clear turquoise waters. Ringed by golden beaches and palm trees, Madagascar island has an interior that is resplendent in its variety, from grassy plateaus to volcanoes and opaque forests and natural reserves. Many species that are unique to the island have evolved, including 3,000 indigenous species of butterfly. Madagascar is legendary for the profusion of its wildlife and flora, 80% of which is found nowhere else on earth. 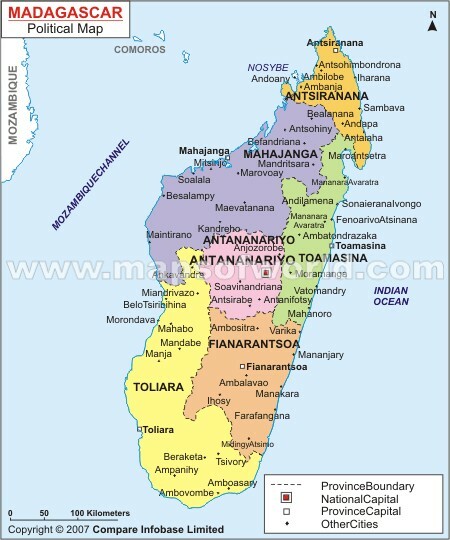 Also known as 'Tana', the Malagasy capital is about 1250 m above sea level in the Central Highlands. With a population of around 2 million people, Tana is the centre of the Merina tribe, who resemble the Malayo-Polynesian component of the first Malagasy settlers. The city is set in a basin surrounded by 12 hills. Much of the surrounding countryside is devoted to rice paddies. The houses of highland towns are typically multistoried brick constructions, often with wooden staircases and balconies, built along narrow, cobbled streets and alleyways. Visit the markets, the Parc de Tsimbazaza zoo, museum, botanical gardens and enjoy the restaurants and night-life. Credit cards (the most useful credit card is VISA CARD) are only accepted in large hotels, restaurants and some shops, mainly in Antananarivo. In the other big cities, you can get cash from Automatic Cash Machines (ATM) only with VISA CARDS. There's now also an ATM at the airport in Antananarivo. Don't rely on ATM machines only; they are often out of order. Keep some cash in Euro for emergencies.